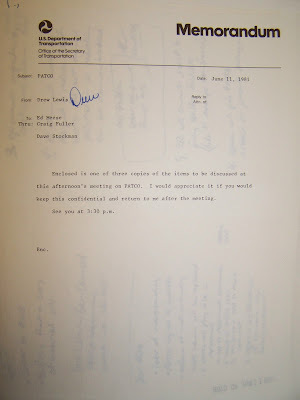 The key excerpts of the Lewis memo, which I found in the Reagan Library, can be viewed here (it includes some inserted annotations and a concluding assessment by Secretary to the Cabinet, Craig Fuller). The memo was historic in its implications. It was written by the secretary shortly after PATCO held its national convention in New Orleans on May 23 where it set a strike date of June 22, 1981. If the government didn't produce an acceptable contract by then, the union would strike, PATCO officials announced. The strike threat (which is discussed in the memo, as Lewis reviews what could happen under a variety of strike scenarios) got the government's attention. 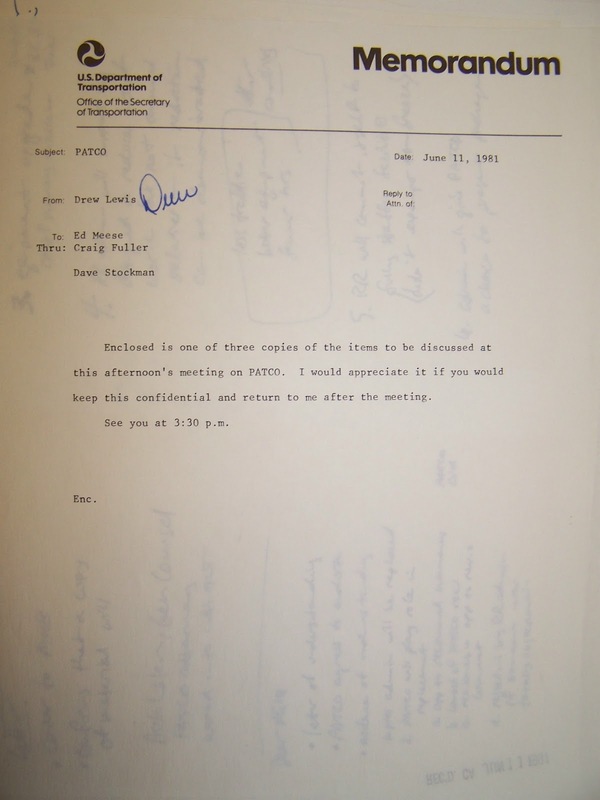 It prodded Lewis to lobby Ed Meese and Reagan's other top advisors for permission to make PATCO an offer that would ultimately be worth $40 million in total, which Lewis believed would be enough to avert a strike while still showing enough restraint not to undermine Reagan's budget-conscious agenda. In the memo, Lewis explains that he wants to use the money to increase the differential pay controllers got for night work, to offer differential pay for on-the-job training, and to provide a guaranteed lunch break to controllers that would act as a small salary boost. After some internal debate in the White House, it was decided to give Lewis permission to make an offer along these lines. This was quite significant. Under the rules of federal bargaining in the federal sector workers were not supposed to be able to bargain over their compensation. Previous negotiations had not seen this happen. (And, in my view, the Reagan administration would not have broken new ground here had controllers not threatened a strike.) The seasoned federal mediators, Moffett and Flores, thought this was a precedent-setting offer. It would add about 6.6 percent to the compensation package controllers had enjoyed before this point. When added to the 4.8 percent salary increase that all federal workers were scheduled to receive that fall, it meant that controllers would see a bump of 11.4 percent in their overall compensation package on average (this is spelled out in Lewis's memo). The government would later emphasize this point and argue that the controllers' decision to reject the offer was motivated by nothing but greed. This wasn't so, but before I explain why the controllers weren't greedy, let's be clear: the offer was precedent-setting. Indeed, the fact that it did set a new precedent worried the Reagan people. Look at the notes that follow the Lewis memo on the last page of the document. Summarizing the plan, Craig Fuller called it a "significant departure" from past practice and worried that it would, among other things: undermine management's morale at the Federal Aviation Administration (FAA); provoke a backlash from Congress and the public at a time of budget cutting, austerity, and economic stagnation; lead other federal unions to demand similar treatment; and conflict with the administration's efforts at "belt-tightening." Reagan nonetheless approved the offer. 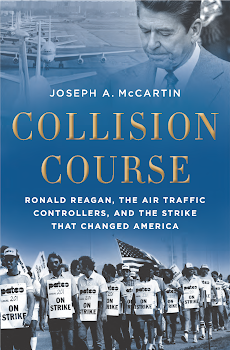 As I explain in the book, he and his advisers did want to help PATCO both because they believed controllers had some legitimate gripes and because PATCO endorsed Reagan's election and the Reaganites wanted to show that Reagan remembered his friends. (They had visions of keeping the support of a few key unions of "Reagan Democrats" as a way of demonstrating their concern for working people and building an enduring coalition that would cut into the Democrats' base.) But to avoid the backlash that would come from dramatically setting a new precedent, the Reagan people never played up the path-breaking nature of the offer and they made sure that offer was made to controllers in a form that would not provide an easy precedent for other federal unions to copy. Thus Lewis sought and won permission from the White House to put $40 million toward wage differentials for night work and on-the-job training as well as a paid daily lunch break (because controllers most often had to eat on station, that meant that in practice they would be able to collect pay beyond 40 hours for working 40). You can see the mix of components for the offer in the chart within the Lewis memo. To read how the New York Times explained that offer and how Lewis and PATCO president Bob Poli discussed it on the morning of June 22 when the union tentatively accepted the basic framework of this offer (because it did not meet its own strike-vote target in the final hours of negotiation that morning), see this article. In the end, the precedent-setting offer was conferred in a format highly specific to controllers' work, so it could not be easily replicated in the demands of other federal sector unions. But because it was offered in this way it was harder for controllers to see it as significant. So even though the union tentatively accepted the offer on June 22, a wave of dissatisfaction soon swept through the union and led controllers to vote the offer down and go out on strike on August 3, 1981. So that is how the paradox was possible, how a precedent-setting offer could fail to impress the controllers. Why this sorry state of affairs came about had much to do with the deeply flawed policies governing labor relations in the federal government, and with the particularly dysfunctional dynamics of FAA labor relations, a story that reaches back into the 1960s and that I tell in full in the book. So, was union greed at work here? No. The facts don't support that view. Did the Reagan people intend from the beginning to bring on a strike as a way of purposely undermining labor? No. The facts don't support that view either. However, as my book makes clear, while the Reagan people did not set out from the beginning to use PATCO to undermine the U.S. labor movement, had they actually had such a plan they could not have come up with a better scenario than the one that played out for them on August 3, 1981, when the controllers walked out in hopes of pushing the government to make a better offer. At that moment, the administration pivoted, cited the 11.4 percent package that controllers were rejecting, and quickly whipped up public opinion against the illegal strike (this was not hard to do since many workers were suffering much more than controllers in 1981 and had little sympathy for a federal union whose members on average earned above the median income and who were, after all, rejecting a wage increase just as a recession was setting in). PATCO was thus quickly isolated and broken (much to the satisfaction of the more anti-union members of the Reagan administration). Its destruction ushered in a mean-spirited era in U.S. labor relations that affects us to this day.